A preliminary measure 4.0 earthquake struck at 2:41 a.m. on July 21, 2015, 2 miles east of Union City, Calif.
FREMONT, Calif. -- A 4.0 magnitude earthquake struck at 2:41 a.m. near the intersection of Mission Boulevard and Niles Canyon Road in Fremont, California. As of 3:27 a.m., there have been eight aftershocks since 2:41 a.m., the strongest being a measure 2.7. BART is running 15-20 minute delays to inspect tracks for any possible earthquake damage. 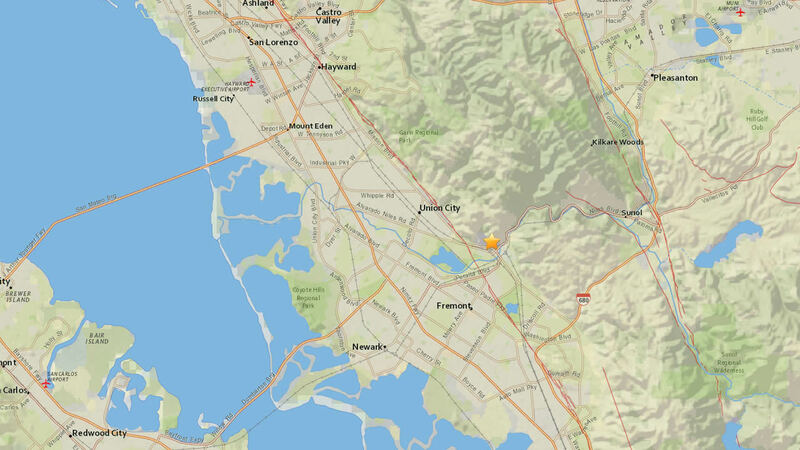 Many people in the East Bay and as far south as San Jose say the quake woke them up. There are no immediate reports of any damage. @abc7newsBayArea felt it in south San Jose. My dog woke me up and then I felt a quick jolt. My dog is probably the best warning system yet! @abc7newsBayArea We felt it here in Downtown San Jose. One small shake followed by a slightly larger one. @abc7newsBayArea and peeps..don't forget to report that you felt it on the USGS site. Short survey. If you would like to report that you felt the initial measure 4.0 earthquake at 2:41 a.m., click here to report it to USGS. Stay with ABC7News.com for the latest updates and tune into ABC7 News starting at 4 a.m. for live updates.